Turbula - Music - Review of "Last Train to Bluesville"
The Nighthawks have been reliable roots performers since the early '70s. On many previous discs, they have hit their marks with clean and tasty electric blues-rock and R&B, especially on covers of familiar standards. Long time vocal/harpist Mark Wenner has been in the band for more than 35 years, as has drummer Pete Ragusa. 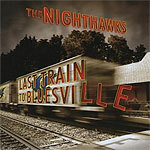 The latest disc by the band, "Last Train to Bluesville," marks Ragusa's departure, and was recorded live and acoustic. For this project, the band picked ten solid blues covers, and kept the arrangements straightforward. The band usually uses two singers  Wenner and bassist Johnny Castle  and on this disc use three, with even Ragusa getting to do a vocal. The years of experience playing gigs oozes into each of the chestnuts, as the band elevates this set above a glorified jam session to a polished live document. A lot of that has to do with guitarist Paul Bell. With a rhythm section of snare drum and standup bass, and the only other sound coming from harp, he has a lot of space to fill and does so very well. On such songs as Muddy Waters' "Nineteen Years Old" and "Can't Be Satisfied," he lays down chords, slide lines and lyrical statements seamlessly. The gang might be unplugged, but "You Don't Love Me" doesn't lack for any boogie drive as Castle snarls the words and Bell echoes the lyrics with his slide. Slim Harpo's "Rainin' in My Heart" is given a New Orleans treatment that leaves the listener wondering: How do they manage to do all that with one snare drum and one acoustic guitar track? The answer: lots of gigging. Many of the tunes here are songs that this band, and others, usually cover in plugged-in sets. Maybe that is why "Last Train to Bluesville" is so refreshing. The listener doesn't really notice the Nighthawks' latest offering being "acoustic" and "live," just good.